2013 Track Schedule is Released Online! We have been extra busy this off-season getting all the final pieces in place for what promises to be one of the best schedules in Firebird history. We’re very excited to give everyone a chance to block out your favorite events before the official printed version hits your mail box in few short weeks. The color hard-copy brochure will be in your hands before the end of February, which you’ll be able to keep at your home, in your car and/or at your office. Starting in April and continuing through October, we feel the 2013 Schedule offers a wonderful array of quality family-orientated and action-packed events. Headlined by the grand daddy of `em all, the Pepsi Nightfire Nationals returns August 8th thru 11th. The planning wheels are already in motion for what is promising to be an extra special weekend of racing as we continue our alliance with the NHRA Hot Rod Heritage Racing Series. From the day the Nightfire ended last August, we have been steadfastly putting all the ingredients together for what is shaping up to be one of the largest events of its kind in Idaho racing history. The Nightfire will be highlighted by a full 16-car field of AA/Funny Cars, a strong field of AA/Fuel Dragsters, the West Coast Outlaw Pro Modified Doorslammers, and the nationally-acclaimed Bracketeer Series. Without question, this race will continue to earn the right to be recognized as Firebird’s “signature event” this August. Many recognizable and highly popular races return to the Firebird racing docket ranging from the six-race Fairly Reliable Bob’s Club Challenge Series to the United Dairymen/CWI High School & Alumni Championships starting in late-April and wrapping up in September. We are also thrilled to jump start the Division 6 Lucas Oil Drag Race Series with the longest-running major drag racing meet better known as the Ignitor. The 43rd Annual Nitro Opener officially known as the NAPA Auto Parts Ignitor presented by Dan Wiebold Ford will help kick-start the major event calendar. 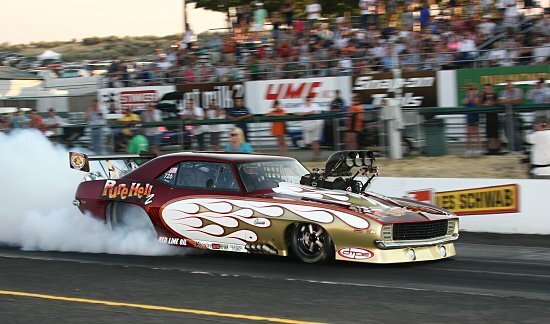 The event will feature an open-qualified field of AA/Funny Cars, as racers earn important points in the NHRA Hot Rod Heritage Series at the first stop after the prestigious March Meet in Bakersfield. In addition to all the NHRA traditional classes from Comp through Super Street, Gold Cup racing will be offered in Firebird’s four core categories of Super Pro, Pro, Heavy and Sportsman. All four champions will take home NHRA Wally trophies. We’re also making plans to send a full field of Firebird’s best racers to Spokane County Raceway, which will be the host venue for the first-time in the thirty-six year history of the Summit E.T. Finals. A total of 58 racers will earn a spot on the Firebird team and will make the “Trek to Spokane” over Labor Day weekend. Looking a little further down the road, the major event schedule will close with a bang, too, as the 20th Anniversary of the NAPA Halloween Classic returns on October 9th-13th. Last but certainly not least, be sure and mark the dates March 7th-10th on your planning calendar, too. The O’Reilly Auto Parts Boise Roadster Show presented by Les Schwab Tires always helps to kick off the automotive calendar in the Treasure Valley at Expo Idaho. Best of all, Firebird will have a booth in the show again this year and you can learn all the latest news and information as the countdown kicks into gear for the fast approaching race season. So don’t wait any longer, go ahead and click on the SCHEDULE button at the top of our website and you can see the entire 2013 Schedule in detail. Enjoy!